Valentine's is almost here and that time old question plays on our minds, what should I get for my loved one? Chocolates, flowers, a handy set of ready meals with a bottle of wine? Those ideas are great, but we all know there's nothing better than the gift of handmade, but even that comes with its complications. How long should you wait until you cast on, will they appreciate all those cables or that you've used a one off hand dyed yarn? How much of your precious time should you spend making something? Last year we heard the story of the girl who spent £100 on some very designer yarn for her boyfriend's jumper, knitted it in secret, then before Valentine's day was dumped! So, this year we decided to put together a handy SL gift guide on what to make based on your relationship status. Not only is it cost effective, but the knits don't take too long either, so whatever you choose to make you'll leave a great impression. If you've just started dating someone and want to make them a totally unnecessary gift that casually shows off your making skills, our phone cosy is the project for you. These squishy phone holders don't take long to make, consist of just knit stitch and are decorated with a cute animal face. They look like they've taken you loads of time. You can personalise them by coming up with your own felt design. Plus they're knitted using only a ball of super chunky yarn so won't break the bank. Best of all you can download the pattern for free. Skill level: Easy - You just need to know how to cast on, knit and cast off. If your partner has been brave enough to meet your family, with all their quirks and odd rituals then congratulations, you're ready to knit them something they might actually use. Mix and match their favourite colours into a warm hat that they'll cherish forever. If you're feeling brave then why not make yourself one too and achieve the ultimate couple goal: to be completely matching. Find the single kit here and the couples kits here. Skill level: Easy - you need to know how to cast on, knit, purl and cast off. Time to make: 1 - 2 hours per hat. If you're really serious about someone then let your closest 600 Facebook friends know by sharing it on your social media. Or if you're not into linking profiles including your love in your profile picture will also do. If you've made it official then it's time to get seriously cute with your knitting. Make them a mini animal head, like the tiger and bull we designed for the V&A. These make the perfect work or home companions and will constantly remind them of your amazing knitting abilities. Everything you need to make them comes in a handy kit. Skill level: Easy - you need to know how to cast on, knit, increase, decrease and cast off. Time to make: 3 - 5 hours per animal head. There's nothing quite like your first trip away together and if that happens to be over Valentine's then you'll need to bring an extra special gift. 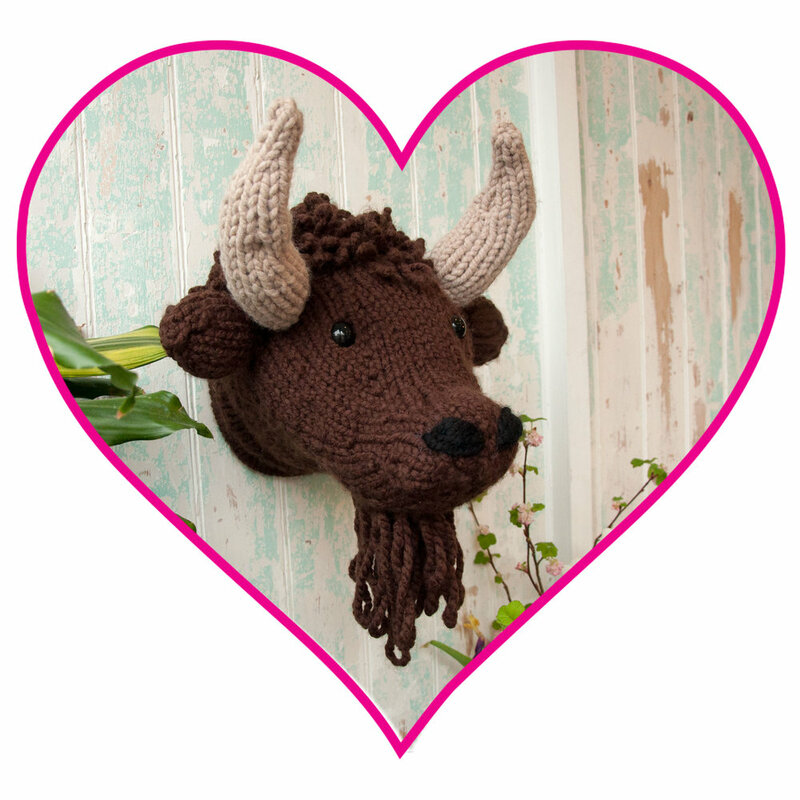 Make your partner a cute buddy like one of our Scrap Yarn Challenges. On your first City Break you probably won't have much room in your case for a giant toadstool or bear head so one of these critters is perfect. What's even better is that they're stash busting projects so you can make them from your overflowing yarn stash, which means more spending money for your travels. Skill level: Easy to Intermediate - you need to know how to cast on, knit, purl, cast off, increase and decrease, cast off and a few other techniques. Time to make: 6 - 8 hours per project. Once you've moved in together you'll need some knitted decorations to make the place feel cosy. Take Valentine's as an excuse to add your stamp to the sofa with this pair of half-cat, half-mermaid cushions. The Mer-cat and Pur-maid are knitted using our mythically chunky yarn are are guaranteed to make your roomie smile. Just think about all those cuddles on the sofa whilst binging on boxsets. Perfect. Skill level: Easy - Intermediate - you need to know how to cast on, knit, purl, cast off, increase, decrease and cast off. They can be worked on straight needles or in the round. Time to make: Both projects should take a week or two of evening knitting - just make sure you make them in secret. So you've reached that stage of your relationship where you know you'll be together forever, that can only mean one thing, it's time to make your partner an amazing gift. But wait, we'd still say be very cautious about that jumper pattern you've been thinking about knitting. You could spend twenty - thirty hours making a lovely sweater using a vintage pattern only for your partner to never wear it - we're talking about you Mr. Sincerely Louise. Go for something fun like an animal head, it's big, bold and looks a lot harder than it actually is to make. Skill Level: Intermediate - you need to know how to cast on, knit, purl, increase, decrease and sew up. Time: 2 - 3 weeks of evening knitting. Or if you're really keen they can be made in a day!